I don’t know why I never thought about the differences in religion there might be between Christians from the US versus Christians from Asia – but there are! Check out my latest blog, where I went to Bible study, the clubs and then island hopping in just a few short days. Busy, busy, busy! Greetings from hot and humid Hong Kong everyone! I had yet another busy week in the land of humidity like you wouldn’t have believed. Let’s see what had happened since I posted my last update. On Wednesday the prior week, the business school hosted its farewell dinner for all the exchange students. Because I was a member of the Exchange Activities Committee, I was naturally coerced into helping make it happen. My job was relatively simple compared to the other activities we’d done though. All I was asked to do was come up with 30 – 40 questions in the style of “Who Wants to be a Millionaire” and make it Hong Kong, HKUST, and exchange student based – not too hard. At 7 PM, everyone started showing up and the dinner turned out to be pretty nice – lots of vegetables and vegetarian dishes along with some fish, curried beef, and the most deep-fried sweet and sour meat I’d ever tasted – it was so deep-fried it was hard to tell where there was actually a bone as opposed to just really fried exterior coating. There was also fruit and funny jelly/coconut desserts too, which were not bad either. Part of the banquet dinner. 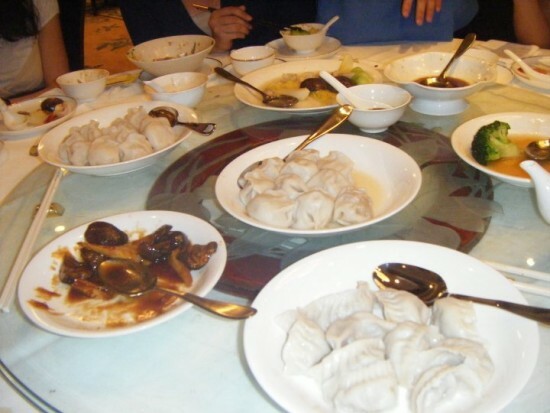 Yum – dumplings! Throughout the evening they had random prize drawings (I won a little ceramic gourd-shaped object with holes in it that’s actually a musical instrument: an ocarina for those of you familiar with Zelda), various games (including my questions, which turned out to be a pretty big hit – a few of the better ones were “Can you name an exchange student who has thrown up in the cab on the way back from LKF?” and “How many Thomases can you name?” – we had a ton of Thomases in our exchange group), a writing in Chinese without using your hands contest, and the funniest of all was the contest where a contestant wore a hard hat that had a pole with a string attached to it and attached to the string was a bun. The object was to get the bun to your mouth and eat it without using your hands; I have never laughed so hard in my life as when I was watching the two boys trying to eat the buns as fast as they could and the buns just swinging wildly all over the place! It was definitely a good time, and probably one of the last times the majority of the exchange students would all be together and not separated into the various little cliques we’d formed into over the course of the semester. On Thursday night, one of my Iranian friends, Mahdi, invited me to attend a Christian Bible study dinner one of the professors was hosting at his apartment. I accepted since I had never been to a Chinese Christian service of any kind (and probably never would again), and it was quite interesting. The first thing I noticed was that the apartments that the professors got to live in on campus were really quite nice, and the couple hosting the dinner were some of the nicest people you could meet. There was one large problem however: the entire Bible study portion of the evening was conducted entirely in Chinese. Did I mention I still didn’t speak a word of Chinese? Thank goodness one of the women attending had lived for 23 years in the US with her husband before he suddenly decided to come back to Hong Kong and become the dean of the HKUST science school. She translated for us through the entire readings, hymns, and testimonials from all of the people there. It was fascinating to me that many of them had not found Christianity and been “saved” until very recently – many upon coming to Hong Kong – but they were some of the most fervent and devout new Christians I’d ever met. So it was an experience to say the least, and everyone I talked to was very friendly and tried to make an effort to invite me to daily prayer sessions they had (it was mentioned that these were all conducted in English). I didn’t think I’d be going back before the end of the semester, though. It was very different from what I was used to, and I got a taste of it, so at least I could say I did it, but not exactly my cup of tea. Our favorite taxi driver, Taxi Dennis. 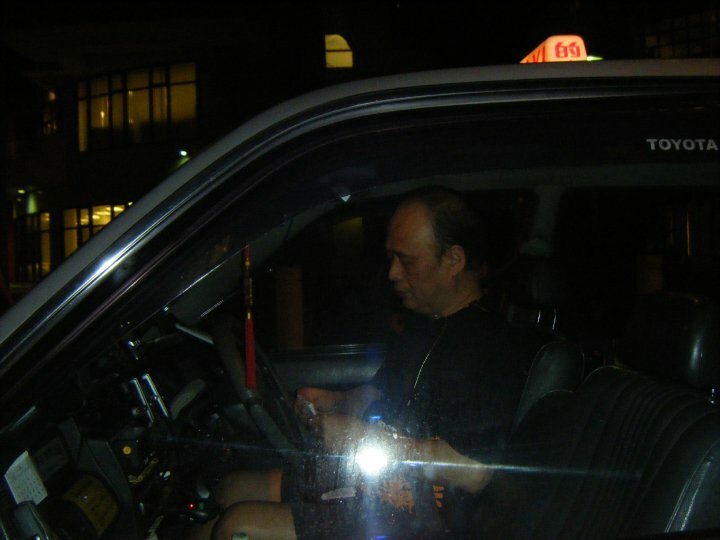 He offered a flat rate for exchange students to and from LKF. He was the man! After that I went out with a group of my girlfriends to LKF and danced the night away in various clubs until 4 in the morning. I had a great time, especially after the disaster that were the parties of the past weekend. The weekend prior, LKF didn’t happen because of rain and then because I was dragged to the lamest beach party ever. But that week was great – just girls so we didn’t have to worry about the boys being jealous (this happened a good deal during my time there – shocker, I know) or not getting into clubs for free (Thursday was Ladies’ Night so girls got free entrance to almost everywhere and free drinks) or anything like that. We danced and danced and floated between various clubs, ran into other HKUST people and friends from other universities also out. Good times. The only bad part came at the end when we left the club as it was closing and it was pouring rain outside. Damn. Trying to negotiate a cab ride in the rain was not so much fun, but it let up a little and we made it in home in the end. The past weekend was the weekend of island hopping around Hong Kong. On Friday, two girlfriends and I hopped a ferry to Cheung Chau Island where there would later be a Bun Climbing Festival. Yes, that’s right – I said a bun climbing festival. 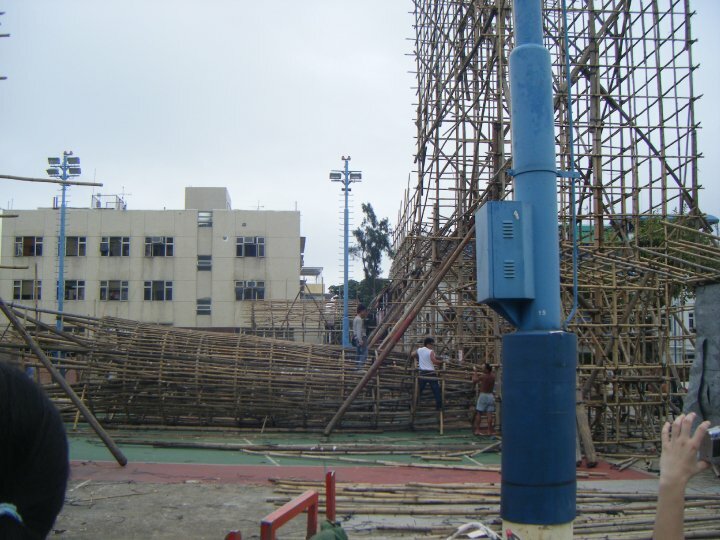 Every May the island has 15 meter tall towers constructed out of buns (they used to be just buns, but after a collapse in 1978 they added a solid bamboo framework underneath) that participants climb up and try to get the highest bun because that brings the most luck for the next year. 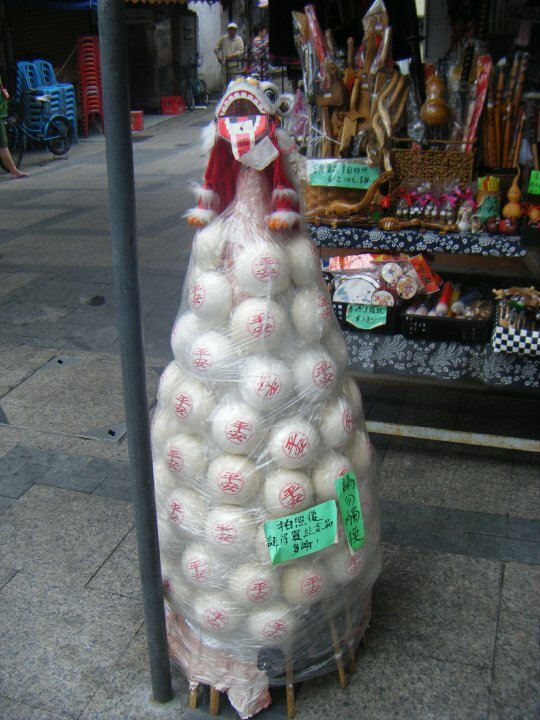 A skeleton of a bun tower being constructed for the approaching bun climbing festival. A replica bun tower to the real deal, which was over 14 meters in height. Saturday morning I met two more of my girlfriends and we set out for Lamma Island, another island about an hour from Hong Kong. We took the ferry to the island’s less popular pier, Sok Kwu Wan, with the intention of hiking the hour and a half trail over to the other port, Yung Shue Wan. We arrived just after noon and started walking. Although the weather back at school that day was terrible and gloomy and rainy, once we reached Lamma it was hot and sunny and gorgeous! Amazing what a difference a couple of hours of travel could make in Hong Kong! The walk across the island from one port to another was nice – it was quite hot – but nice nonetheless. The only thing marring the view was this enormous power plant located on Lamma, that the island seemed to think was a selling point, as there were numerous signs along the way pointing out the direction to the plant. Once we reached the other port, it became immediately clear this was the “cool” port. There were little cafes and restaurants and souvenir shops everywhere. There were also more westerners than I’d seen in one areas since the Rugby Sevens event. We still managed to stumble upon a Cantonese Opera performance though. Haha – it was still Asia after all. It was a really fun afternoon all in all. 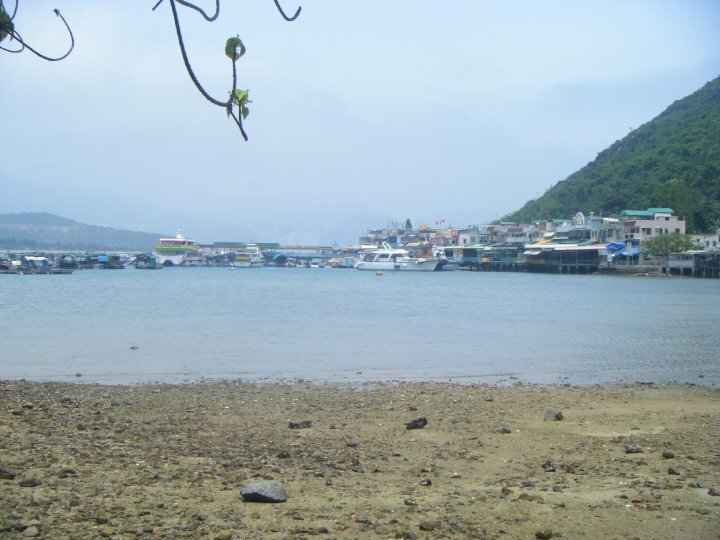 The view of the port we docked at on Lamma Island from the hiking trail. Very pretty. 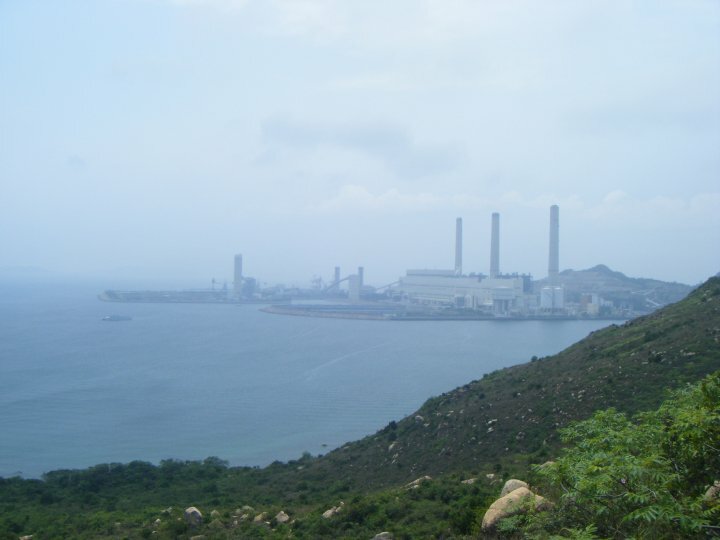 The picturesque power plant on Lamma Island. How fetching. And the weekend was only half over. Don’t miss my next post, when we got fancy and I had some of the best pork I’ve ever tasted. Oh, and I came halfway around the planet, yet still managed to have a flashback from home – wait til you hear this story! 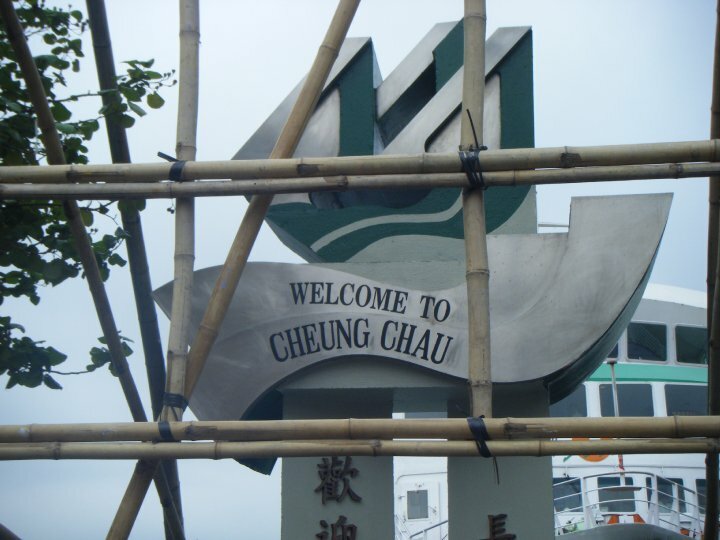 This entry was posted in Asia, Hong Kong and tagged Asia, Bible study, Buns, Cheung Chau, Christian, HKUST, Hong Kong, Lamma, LKF, Travels on April 28, 2014 by Paige N..